That sounds a lot less dramatic than the title Agatha Christie gave us, but when you start with 128 players and too many games to follow in a 24-hour day, there is a certain amount of action and accomplishment in just reaching the quarterfinals. The 2017 edition of the FIDE World Cup has been the strongest and arguably the most dramatic ever. 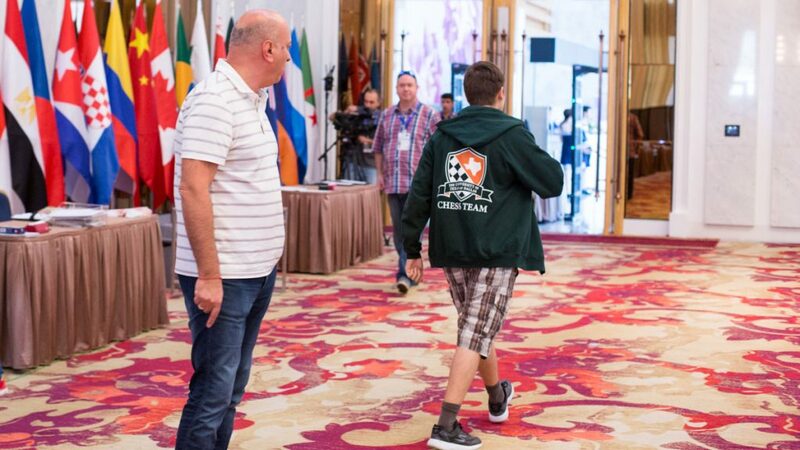 There has been tremendous coverage from the ‘mainstream chess media’, with a wide choice of excellent live commentary, photojournalism and fresh interviews. With an event this big, there are angles everywhere. I’ll try to come at the familiar ones from a different angle, and hopefully make a few odd discoveries along the way as well. There were upsets as early as round one of course, the biggest being the exit of the sensation of the previous edition, Pavel Eljanov. 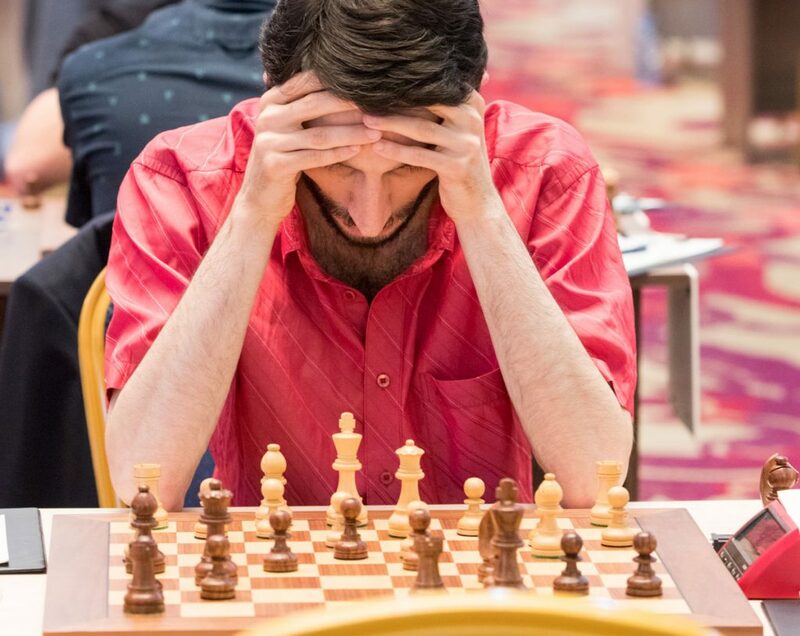 In 2015 Eljanov tore through the event, beating people at real, sorry, classical chess at a rate rarely seen in the KO format, where players constantly trade rating points to rest with draws, and bank on tiebreak day to see them through against lower rated opponents. 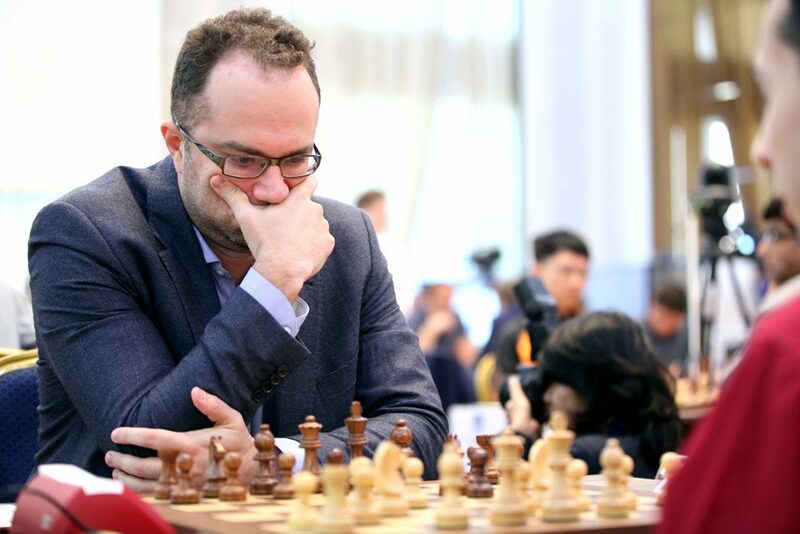 Eljanov blanked Jumabayev, Ipatov, and Grischuk(! ), eliminated Jakovenko in rapids, saw off Nakamura in classical and then finally succumbed to Karjakin’s patented combination of escapology and efficiency in the semis. Pavel’s 2017 KO was maximum nightmare, blundering a full point away with white on day one vs. calm American Aleks Lenderman, and then getting blanked trying to fix this with black on day two. 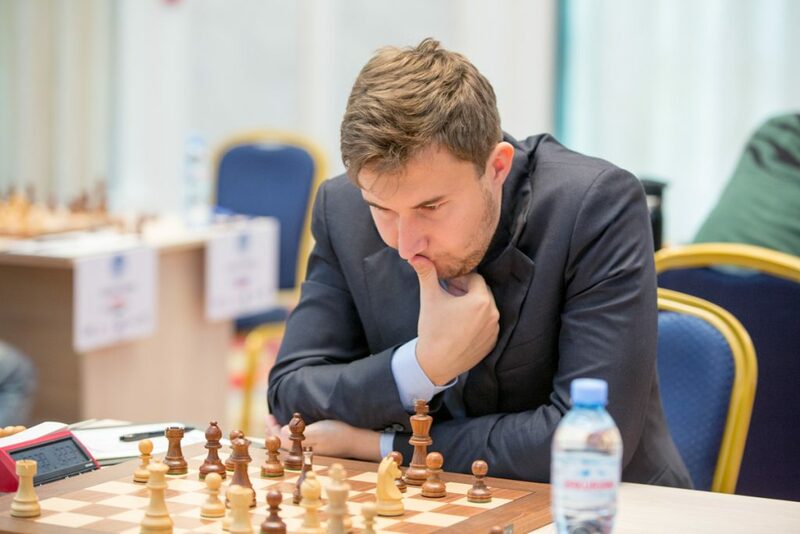 Major shocks started arriving in round two, with Sergey Karjakin being eliminated by Daniil Dubov and Viswanathan Anand going out to Canadian-Ukrainian Anton Kovalyov. For Karjakin, this was not the biggest of deals, as he is seeded into the Candidates as the previous title challenger. For Anand, it meant rather more, since this was his only route to the Candidates barring a wild card spot. Most likely it means the end of an era, with the Indian titan probably sidelined from the title circus for the first time in ages. Both of these matches made a strong impression on me, for very different reasons. I’ll muse about Vishy’s exit when tackling the topic of crashing champions. Karjakin’s elimination again raised the complex and ‘frightening’ topic of modern opening preparation. I used Karjakin’s adventures to illustrate some of the questions around the increasingly cyborg state of man-machine work in the openings in my previous article and the comments from the players after Dubov felled Sergey were very interesting indeed. Karjakin has repeatedly, and admittedly, been caught out forgetting the reams of prepared analysis he needs to know, and in Tbilisi he detailed this again. Dubov had a similar tale to tell after the game, but with one intriguing difference. He cited the exact same moment, and claimed that his 18th move guaranteed him an advantage, but he could not remember the details when playing it over the board. If they are both being honest – and of course there are reasons for them not to be overly so – it reveals an interesting nuance to the high-tech battle of engines and hardware that goes on behind the scenes at the top level. Two players/teams/machines/cyborgs can crunch the same variation and arrive at different conclusions. This might not seem like a major revelation to some, but it hints at fascinating levels of complexity – the engines don’t always work things out, as they did in the game discussed here – and not only that, they don’t necessarily even agree. 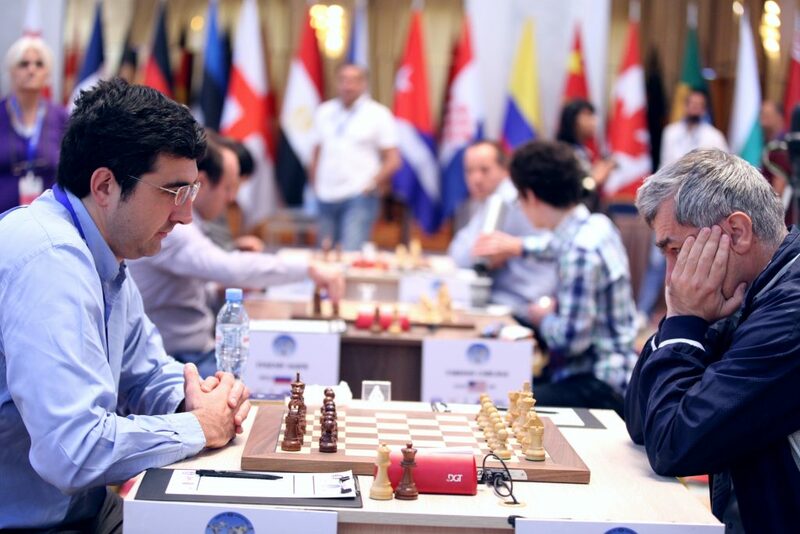 By round three all the world champions were gone – former titleholder Vladimir Kramnik dispatched by simply dogged high class chess from the always dangerous Vassily Ivanchuk. In some ways it is hard to ever call an Ivanchuk victory an upset. In Tbilisi Kramnik never quite looked comfortable. 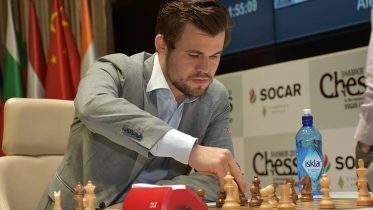 A much bigger shock was Carlsen’s exit in the third round, especially since the reigning champion had shown supreme form in his 2-0 assassination of Alexei Dreev. The Norwegian lost with White in the first game of his match against Bu Xiangzhi, and no matter who you are, winning to order with black to survive is not always on the menu. Bu’s win was not just a sparkling example of enterprising attacking play, it was a masterpiece of sporting psychology, that provided plenty of food for thought. Bu offered a piece for some classical long-term compensation. It was what the old-timers called a ‘real’ sacrifice; not some sham offer that was just part of a decisive combination, but a murky punt that just led to danger and complications, with no clear outcome. Under the circumstances, it came in a diabolical package. There are clearly a few giants who use their whites more violently (Aronian comes quickly to mind), but the smart money is on safety first, and grinding away with higher class accuracy. Magnus is well known for needing an edge just this side of invisible to cause terrible suffering for his opponent, so this champ in good form should be deadly when safe. Bu presented Carlsen with a terrible dilemma: burn your white right out of the opening, or risk direct attack. 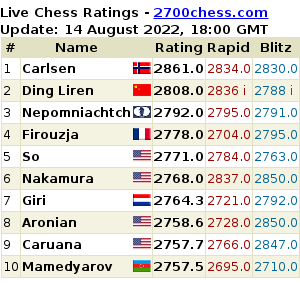 Carlsen’s style may not appeal to everyone, but he is the grimmest of fighters, in the Fischer mold of belligerence. I can only remember him dropping the fight with white in very extreme circumstances – Game one in Chennai vs Anand, when he was learning how to play a title match and was very aware of the sense of occasion; and Game 12 vs Karjakin in NY, when he had planned to burn this game in order to gain the advantage of several days rest. But anything less than title matches, and occasionally even in them, Magnus is willing to lead with his head in order to pursue a full point. When this is coupled with truly tempting bait (Giri assessed the sacrifice as objectively doubtful, for example), I think the choice is clear. World champions don’t back down, it’s not in their DNA. Magnus has to go all in, and when he’s white as well, the pot they are playing for is practically for the match as well as the game. Sharpening play to breaking point as black has interesting ramifications in the KO format, considering the high price of a misstep for white. Of course this is a lot easier said than done. 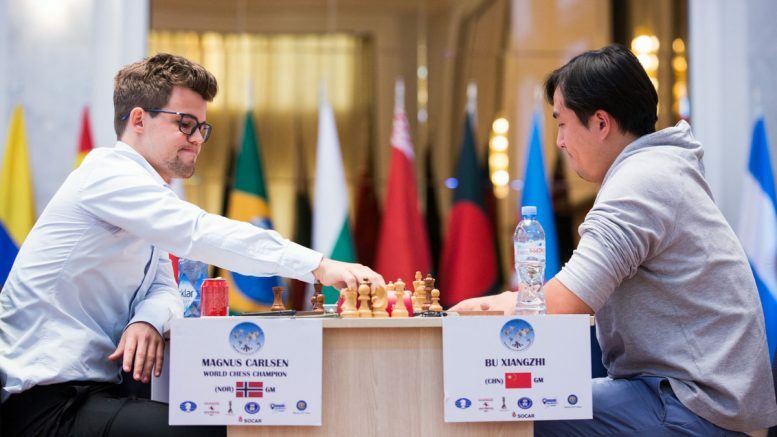 Bu had to not only muster the nerve to toss a piece at the champion – it would be very interesting to know if he ever thought Carlsen would chicken out – he also had to make the most of his chances. 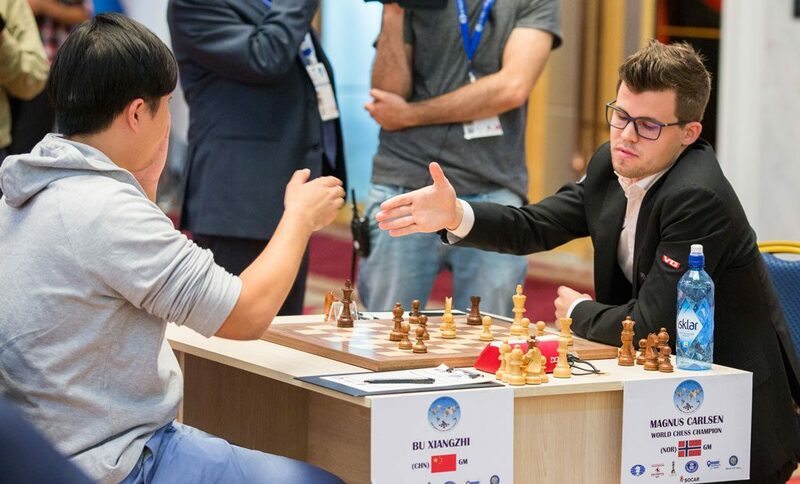 In practice, it was far harder to defend, and the bold Chinese GM produced an evergreen dismantling of a world champion. In the end, neither Magnus nor his last challenger caused any damage to potential candidates in Tbilisi. To me, the exit of ex-champ Vishy Anand was similarly weighty with psychological baggage. I might be reading way too much into it, but for me the decisive moment of the veteran’s duel with Canadian-Ukrainian Anton Kovalyov was a brave, and eventually tragic, insistence on seeking former glory. The strain of advancing years on the serious chess competitor has familiar forms. The accumulation of blows and disappointments over the years, the gradually slowing machinery, and a steadily increasing distaste for suffering result in familiar symptoms. Growing aversion to risk and complication, lowered fighting spirit, and a real hatred for ‘torture’, which often convinces the aging player to resign a bit earlier, and not waste any of their ever more precious time. 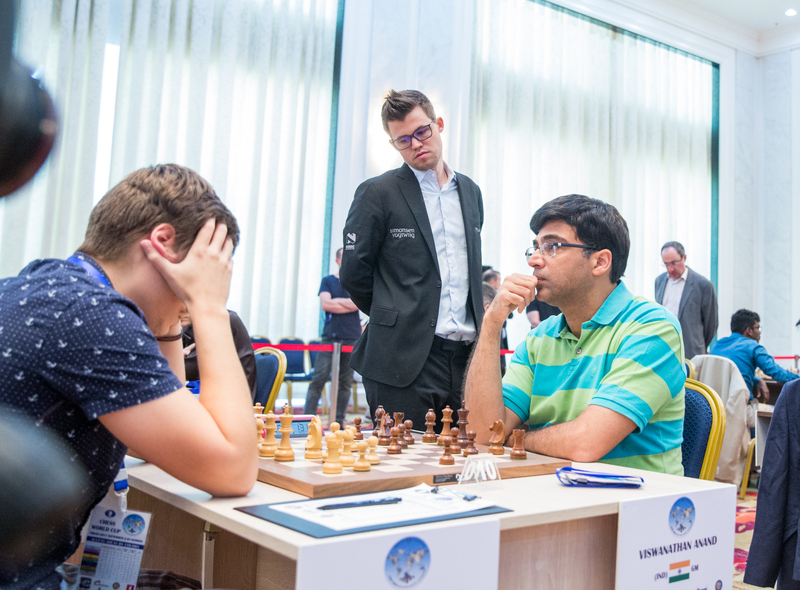 And while Anand has managed to remain a titan after losing his title, he is only human, and he is also gradually showing some wear and tear. To combat this, and to stay at the top of the game, active measures must be taken to strengthen the youthful aspects of the competitive mind – confidence, aggression, speed. A good example of this renewal came from Anand recently, this glorious bit of ‘kid stuff’ against a leading youngster. But this kind of rejuvenation, and searching for the fountain of youth, has its risks and its price. So when seeing this dashing, unnecessary display of youthful exuberance – and the great cost it had for a player doing the kind of thing that always used to work before – I see something quite moving, at least to this old-timer. A great champion fighting against time. It might be futile, but it is in grand style. And I hope it means we’ll still be seeing great stuff from Anand for years to come. Well, it wouldn’t be a major chess event without an international scandal. Rather astoundingly, Kovalyov stole all the attention in round three by withdrawing from the event after an argument with Zurab Azmaiparashvili. Enough has been written about this, and I think it can be condensed into very simple terms. Things like this never need to happen. While the arbiter appeared to be in the process of solving things quietly (though he should clearly have brought the matter up after the game, preferably game 1, round 1) Azmai went on an unnecessary and completely over the top rant that convinced Kovalyov to withdraw. It’s very understandable that he felt too upset to play, and that he would be unfairly handicapped or harassed if he did so, but actually leaving seems like overkill. Or surrender. Anton’s version of the incident appeared on Facebook. Other crazy incidentals are that there is no clear dress code, and there does not appear to have been any attempt to enforce one except for this brief moment. While there is still no dress code, I will continue to argue for fashion rebels to make the most of this web site, which I think adds an important dimension to future discussion about regulations, including shorts. In conclusion, if Kovalyov’s version is precise, the thing that worries me the most about this is not the timing, the offensiveness, the randomness or the pointlessness of the incident. It is the attitude that what the rules or other officials have said does not matter, only what the boss on the spot says matters. This is the real root of the problem. There is a petition of protest from the Association of Chess Professionals, which is a start. Meanwhile, the great feast continues, with drama coming in classical, rapid and faster portion sizes. For me, especially in this engine age, the human elements are what really fascinate. Despite the clear incentive to play the careful odds, there are interesting struggles by players, to adapt, or rebel. 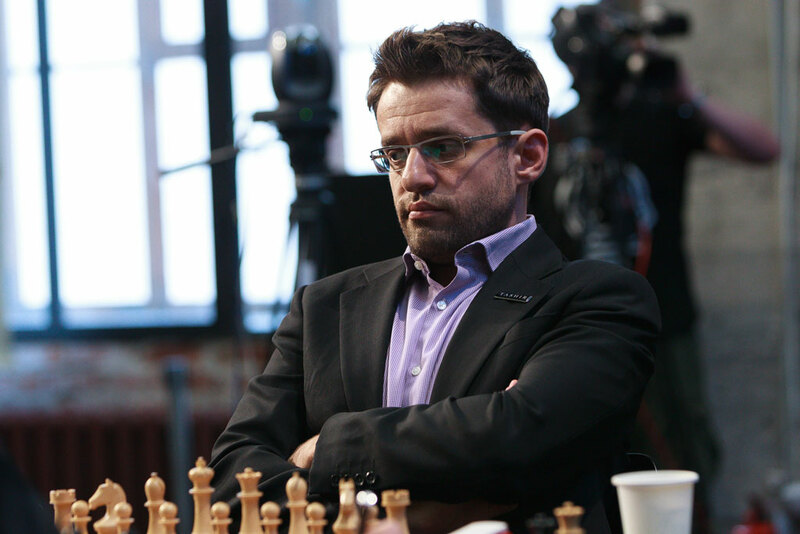 A few of the standouts are the entertainers: Levon Aronian, Baadur Jobava, Richard Rapport, and Vladimir Fedoseev. Without a doubt, home favorite Jobava and Rapport really leashed their inner beast for this event, and the benefits of conformity, while not as breathtaking to watch, were impressive. Rapport’s combativeness has not dampened much, but he has dropped seeking weird adventure from move 1, and shown more sensible openings and some very sophisticated technique. His approach to the round 4 match against Najer was a bit closer to his ‘old’ self, if the 21-year-old and youngest quarterfinalist can be said to have anything aged – a non-stop slugfest with sharp, though not surreal, openings. On the other hand, Jobava played so solidly that if you didn’t know he was here, you wouldn’t have spotted his games. His tiebreak victory over Yu Yangyi was extremely impressive – first a typical flurry of sacrificial tactics in game 3, then a controlled positional crush to sweep the 10-minute rapids. Hugely popular due to his combination of personal warmth and lightning attacking skills, Baadur’s exit in round four saddened his fans, but Wesley So proved too solid, too smooth. I’d also repeat my conjecture about Levon’s cyborg preparations from my previous article – his openings continue to show that unique streak of personal styling that few others seem to match. The final eight is a contrast in brackets; familiar ‘legends’ on one side, surprising youngsters on the other. The split is best illustrated by noting that Ding Liren – aged 24 – is the veteran of the right bracket! Half of the quarterfinalists have given the appearance of control so far; So, Vassily Ivanchuk, Peter Svidler and, Maxim Vachier-Lagrave – though with MVL you have to forget the shaky start in the very first game – a pawn down for nothing much vs tongue-twister Muhammad Khusenkhojaev. But since then MVL has been arguably majestic. Eliminating Grischuk is a tough job for anyone, and must be a reassuring indicator of form. I wondered online if Svidler-MVL was the only maximum pairing. If I meant that as the only one involving two players who advanced by just beating people below them, I was right. But of course none of the quarterfinal matches are between two players seeded to be there. Svidler is standing in for Carlsen, Ivanchuk for Kramnik, Fedoseev for Nakamura, Rapport for Caruana, Ding Liren for Mamedyarov. MVL played a ‘maximum’ opponent in round 4. Ivanchuk defeated both top seeds in his section to reach the quarterfinals. There are more favorites left than there were in 2015, when only 2 of the top 8 seeds made it to the quarterfinal (Nakamura and Giri). In Tbilisi, So, MVL and Aronian have survived to this stage.